Tea is Sensitive, especially good tea. Mug made of pure good quality porcelain is idea utensil for Tea Enjoying, Because Porcelain is non-smell, non-taste, so there is nothing add into soup when you enjoying tea. But Material like Metal & Plastic is not a good thing for tea maker which normally add bad smell or strange taste into soup. Our Porcelain+ Stainless Steel Strainer, add a small piece of stainless steel screen on porcelain infuser, then have extra fine 0.3MM holes to filter 99.9% small tea piece, meanwhile affect the tea soup slightly. Apart from loose leaf tea, the mug can be used with tea bags, fruit infusion in water, and even coarse ground coffee. It is packaged in a unique gift box, a perfect gift for your friends and family. All our products come with a standard manufacturer No-Chip Warranty for a period of 30 days from purchase date. Tea Song will replace or provide equivalent substitutes one-for-one at no charge for any piece found to be defective. We want to provide a superior kitchen experience with our products you love. As such, if you aren't satisfied with your purchase, contact us within 30 days, and we'll send you a free replacement or refund. You're protected by a no-hassle and peace of mind guarantee! Add Tea Song Tea Mug to your cart now! BREW TEA EASILY -- Tea mug with lid and an extra-fine 0.3mm hole infuser helps to brew tea in a simple and quick way. Special Shape & Heat-insulated handle. Unique strainer structure (porcelain + Stainless Steel) will let you enjoy good tea with originally amazing taste as far as possible. PREMIUM MATERIALS & CERTIFIED SAFE -- Tea Set are made of high quality Porcelain (FDA Safe, Lead & Cadmium Free), Chip & Stain Resistant, more sturdy than stoneware, Infuser made of High Quality SUS304 Stainless Steel (FDA Safe) - Food & Medical Level, Totally Non-toxic, Non-Rust. LID CAN BE A COASTER -- Lid works as a trivet to hold the infuser. Also keep the tea soup heat when you cover the mug. SIMPLE USE AND CLEAN -- Dishwasher and microwave safe. 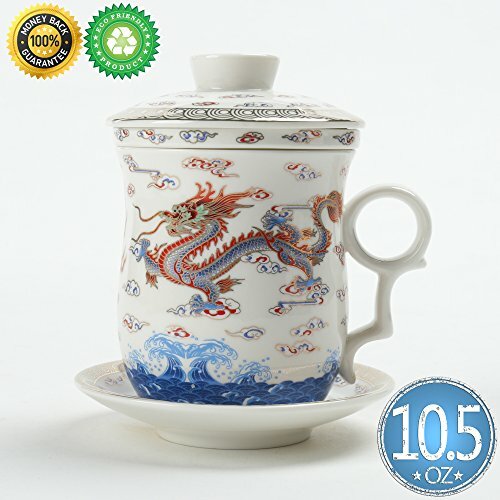 --Tea Mug with infuser and lid:310ml/10.5oz, Please note: Not for stovetop use. Water should be boiled in another vessel first. UNIQUE SHAPE & DECORATION: Special Asiatic Culture shape, Pure natural ceramic appearance without modern material, Naturally & peacefully, Tea mug set is wrapped in a gift box, perfect gift for housewarming, wedding or other holidays. Pls noted that the color boxes may coming with different content due to season changes. 30 DAY NO-CHIP WARRANTY -- Your purchase is backed by our exclusive 30-day No-Chip warranty - Tea Song will offer a free replacement or refund if anything goes wrong with the product. That's ZERO risk! Scroll down for more info. If you have any questions about this product by TEA SONG, contact us by completing and submitting the form below. If you are looking for a specif part number, please include it with your message. CoffeeSock DIY ColdBrew Tea Filter (2 Gallon) - GOTS Certified Organic Cotton Reusable Tea Filters.